Apartment was cute, clean and good location. The host was very quick to address any problems we had. Great place, very comfortable, very clean, good location. Location is good, short drive or walk to main street, apartment was clean and kitchen had everything you need. Clean and contemporary. Great location. Great town. Brand new, location was excellent could walk into town, very clean. Good location, everything in unit #3 was newly renovated. Nice and clean . Owner was courteous and nice to work with. Apartment was convenient to restaurants, shopping and also Olympic attractions and mountain climbing. It was a nice place overall and located near a restaurant which was nice. The porch was also really nice to sit out and have dinner. Offering a terrace with shared barbecue facilities and a seating area, Downhill Apartments is located in downtown Lake Placid. Free private parking is available on site. Each unit has an air-conditioner and comes with a seating area. A flat-screen TV and DVD player are also provided. Some units feature a dining area and/or patio. The apartments also have a kitchen with a dishwasher, an oven, a microwave and a coffee machine. There is a private bathroom with a shower and a hairdryer in every unit. Downhill Apartments offers free WiFi throughout the property. A range of activities are offered in the area, such as skiing, ice skating, and golfing. Lake Placid Winter Olympic Museum is 2,650 feet from Downhill Apartments, while Olympic Jumping Complex is 1.6 mi away. The nearest airport is Burlington Airport, 62 mi from Downhill Apartments. When would you like to stay at Downhill Apartments? This is a historic building known as "Downhill". It was completely remodeled in 2015. Neven Manojlovic is running vacation rentals in Lake Placid since 2008. It is located "South of Light" very close to Main Street and the village's "downtown" area. House Rules Downhill Apartments takes special requests – add in the next step! Downhill Apartments accepts these cards and reserves the right to temporarily hold an amount prior to arrival. The apartment was definitely smaller than expected. The bathroom was fine for just traveling with family but didn't give much privacy since the door was a thin slider and right next to the couch! WiFi password didn’t match the instructions given in the room. Please provide extra blankets in the closet. Thank you for putting traction strips on the stairs! Thank you for being accommodating with our request for a later check out time. This unit is new but already shows signs of wear. The few hooks hang dangle from the walls by a screw. The shower is nice but there is no hook nearby to hang a towel or shelf to put a bar of soap. The mini fridge has no ice. Several light bulbs were burned out, including the one in the shower. We had to buy paper goods. The heat was good and the wifi worked fine. Linens were nice and clean. Satalite tv had no sound. Could not reach anyone to fix. Sofa uncomfortable to sit on, bed too soft. Great location. 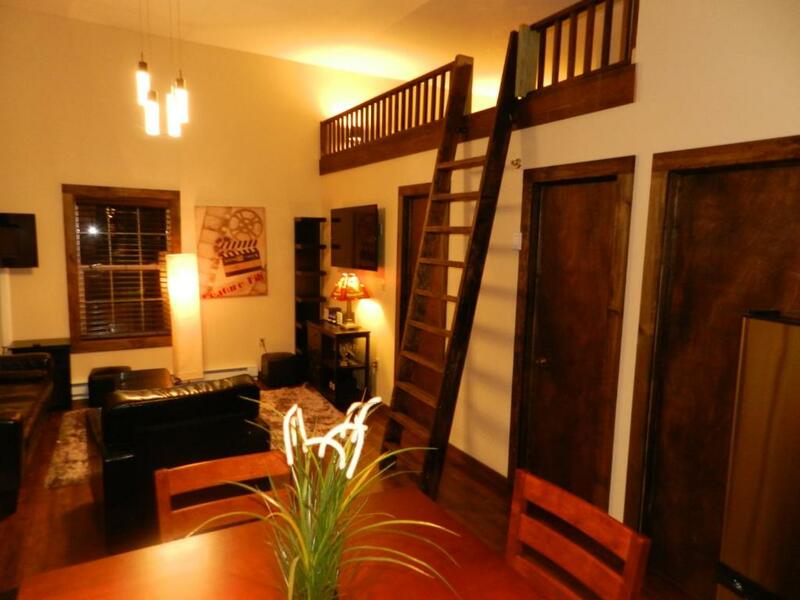 Walking distance to a great restaurant and liquor store. Loved the kitchen facilities, shower and layout. Will definitely come back. The walls seems to be made of paper, so if you have loud guests in the apartment next to you or below you, you are in trouble. Walls were paper thin. Had trouble sleeping because the neighbors upstairs and next door. Could hear whole conversations next door. Bed frame was broken upon arrival and created a hammock that was bad for back. Left owner message but no response. Make sure they have fixed the bed before using.